Nissan has found great success following the launch of their EVs and as such they have begun Motor Co. will introduce two new technologies this year to push the needle even further in terms of making Nissan a leader in electric vehicles and…self-driving cars. Nissan is developing an all new range extender that will tackle two of the biggest issues confronting electric vehicles: cost and limited range. For upcoming Nissan EV’s they are making a new hybrid system they call “e-Power,” which most recently made its debut as a concept in the sporty Gripz compact crossover shown last fall at the Frankfurt auto show. e-Power uses a very similar system compared to the Leaf’s primary U.S. competitor, the gasoline-electric hybrid Chevrolet Volt. 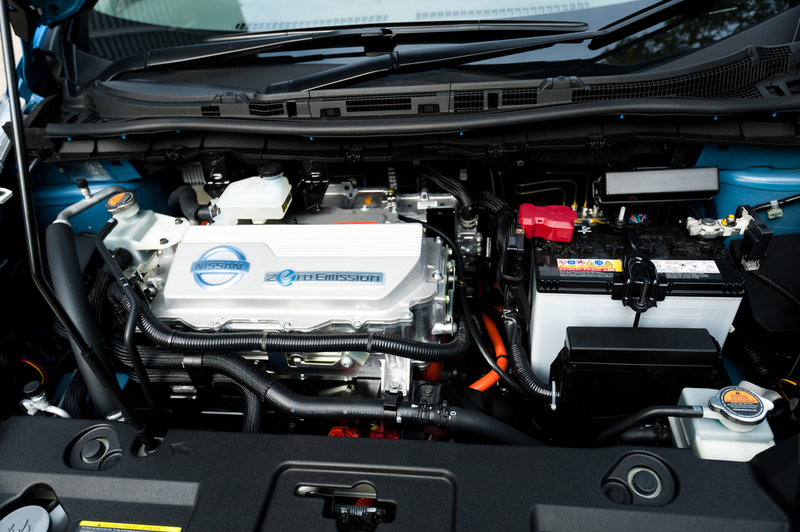 In other words, Nissan’s e-Power uses a small engine in order to generate electricity that charges an onboard battery. That said battery powers an electric motor that turns the wheels. The new Nissan leaf has gotten a very visible and very sporty style upgrade however the biggest difference from the Leaf is the engine. With the new range extension, whenever the new car’s battery runs low, a gasoline engine will kick in to recharge it, in order to give the car a longer range. This has been seen as a disappointment for many hoping for an all new “pure” EV update of the Leaf. It should be noted, however that Nissan’s adoption of the technology was likely a response rival General Motors’ solution for electrified driving, which has been seen as more practical than the pure-electric. Despite being an industry leader, in the U.S., Leaf sales dropped 39 percent to 4,697 units through May while sales of the Volt were up 79 percent to 7,871. Of course, Volt sales were buoyed by the arrival of a redesigned second generation late last year. The Leaf has not had a full redesign since its 2010 introduction. The engine doesn’t need to be as big as on a traditional gasoline-powered car: the engine on the range-extender hybrid serves mainly as a backup generator and can be tuned to continuously operate within it range of peak efficiency. Will The New Leaf Be Autonomous? Another big development around Nissan’s EVs and hybrids is the first deployment of Nissan’s upcoming autonomous-drive technologies: a single-lane self-driving steering feature. Nissan Calls this development “ProPilot,” and it actually allows for automated driving and steering around curves within a single lane on highways and also in stop-and-go traffic. They plan for the tech to reach a level where it will function as an autonomous driving system that allows “intersection autonomy” – allowing cars to navigate city intersections and urban traffic without driver intervention. Unlike the other update to the Leaf, Nissan has not yet made a formal announcement when and where the technology will debut other than a projected 2018 goal. “The newest version of this technology will make driving safer and more efficient by offering automated, single-lane controls,” Ghosn said (AutoBlog). Both of these developments put Nissan at the front lines of adopting all new automotive technology, steadily moving away from the traditional industry standard in the hopes of setting new ones. We look forward to what comes next from Nissan.